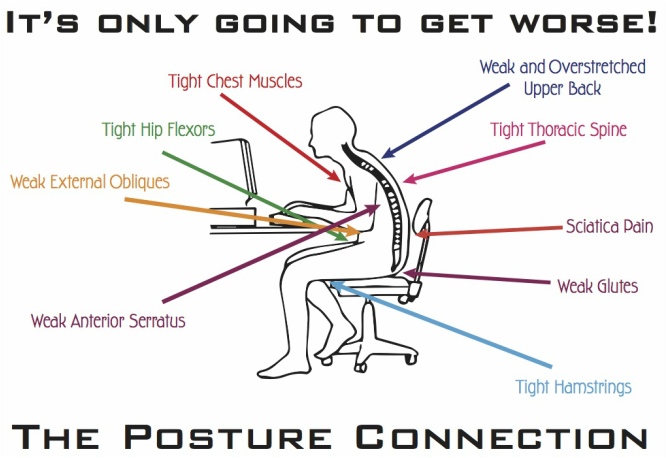 We can correct your posture. We have jobs where we sit at a desk bending over working on a computer or have chairs that make us sit on our tail bone instead of upright. The constant sitting with our shoulders rounded forward makes our chest muscles shorter and tighter, and the muscles in our back are overstretched and they become weaker. This is a flexibility imbalance and also a strength imbalance. This imbalance should be corrected first in any fitness program, and in life. Bad posture sooner or later leads to pain or an injury! Start today with an AFC posture assessment. I would like a posture assessment. Please contact me. Make an appointment for a posture assessment.